From 2010 to 2013, Achiya operated a very successful ADHD program in Elad, with the support of the Israeli Foundation for Children at Risk at the NII. Does he sit restlessly on his chair? Disturb the lesson? A high percentage of children suffer from attention deficiency disorder. How does one tackle the problem, and how can these children be helped? 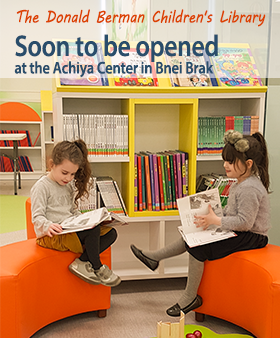 Rabbi Peretz Wertheimer, administrator of Achiya’s multidisciplinary Center for ADD, gives us an insight to the answers in this special interview at the beginning of the new school year. In the last few years, there has been a growing momentum in awareness of the problem of attention deficit disorder in children. In the past, a child who was unable to sit still would be labeled as lazy, or perhaps even “disturbed”; today, it is recognized that the child has a problem which necessitates professional attention – the sooner, the better! This is all very well; however, Rabbi Wertheimer, head of Achiya’s Center for treatment of “ADD” in Elad, says that this awareness is not enough: fragmented comments, heard “in passing”, are the only information many parents have on the subject. Many prefer to deny that any problem exists and do not consider testing. This, of course, can cause irreversible damage for the child. Here lies the importance of presenting a perfectly clear and true picture. So – how many children are really suffering from attention disturbance? What are the symptoms of attention deficiency disorders? The first category suffers from an attention deficiency. These children do not disturb in class, but seem to be very introverted. It is difficult to diagnose these children, as they seem to be saying to the teacher – ‘don’t bother me, and I won’t bother you’. These children can reach the higher grades without having been detected, and then it becomes extremely difficult to treat them, because, in addition to their original problem, there has been added poor social standing, a feeling of failure, and a self image at ground level. The second sub group are children with hyperactivity: excessive body movement. These are the children who seem to be powered by an invisible motor, and they can’t sit still for a minute. Rabbi Wertheimer notes that in the majority of cases, it is possible to identify children with such problems at an early age. The older the child is, the more serious the problem becomes, as the level of learning requires increased mental and cognitive effort. What are the warning signs that indicate the presence of a problem? “Problems of attention deficiency disorder have definite, obvious symptoms. These children have difficulty paying attention for an extended time; they tend to forget things, to lose things, and find it hard to complete assignments, such as homework. Children suffering from hyperactivity, in addition to their attention challenge, will often be unable to sit for any appreciable period of time; they will busy themselves with anything that is to be found on their desks, and can also leave their seats to wander aimlessly around the classroom in the middle of a lesson. Can you describe to us the methods of treatment? “Usually, it is recommended that a child take a medicine, such as Ritalin, or, in the case of his requiring a longer-term influence, Azritalin LA/SR or Konserta. These medicines are effective for the majority of children; however, about 15% of the children do need a different type of medicine, which is matched to their needs by the person treating them. Is it absolutely necessary to administer medicine, or can one relly on behavioral therapy alone? ***Rabbi Peretz Wertheimer directed the multidisciplinary Center for Attention and Concentration Deficiency Treatment in Elad, in a joint project with “Achiya”, the National Insurance Institute, and a certified educational counselor.